In 1970 , Mikhail Gorbachev was appointed the First Party Secretary of Stavropol Kraikom. 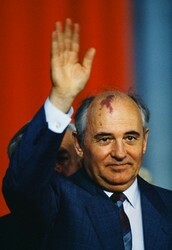 After three years of the deaths of Soviet Leaders, Leonid Brezhnev, Yuri Andropov, and Konstantin Cherenkov,Gorbachev was elected General Secretary by the Politburo in 1985. Being raised in a village, Privolnoye, in the Krasnogvardeisky District. He used this as his motive which lead him towards the Glasnost and Perestroika policy, to improve housing and living conditions. While in power he revealed the secrets behind Stalin's dictatorship. He and Raisa met as students at Moscow University. In the first four years of their marriage, she not find job in accordance with her diploma. In the 1980s, the Soviet Union was engulfed by a multitude of problems. Perestroika (Reconstructing)- a policy in the 1980s that required the economy to reconstruct. This implemented wider economic freedoms, including entrepreneurship and private enterprise, all while being under the soviet plan. = Unfortunately, such an economy took time to thrive, and people found themselves stuck in a worn-out economy, which led to long-lines, strikes, and civil unrest. 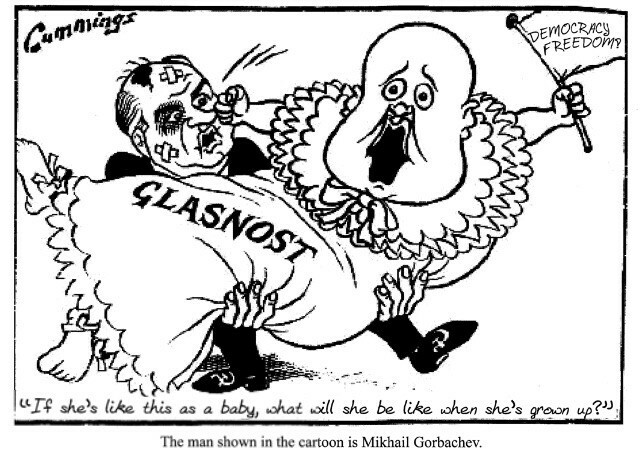 Glasnost (Openess)- political policy in 1985, that allowed for criticism of past soviet practices. It was created to produce openness and a more transparent government to decrease corruption. =The outburst of information about escalating crime and crimes by the government, caused panic in the people. This caused an increase in social protests in a nation used to living under the strictest government control, and went against the goals of Gorbachev. "Nuclear War Cannot be Won and Must Never be Fought." 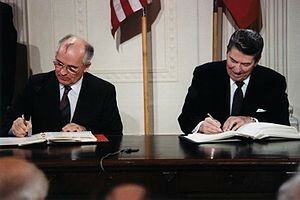 United States-Soviet relations began to improve soon after Gorbachev became general secretary. First summit meeting between Reagan and Gorbachev took place in Geneva in November 1985. -Bush and Gorbachev met in Moscow to sign the Strategic Arms Reduction Treaty (START). Under START, for the first time large numbers of intercontinental ballistic missiles were slated for elimination. "Treaty between the United States of America and the Union of Soviet Socialist Republics on Strategic Offensive Reductions (START I) | NTI." NTI: Nuclear Threat Initiative. Web. 17 Mar. 2015. http://www.nti.org/treaties-and-regimes/treaties-between-united-states-america-and-union-soviet-socialist-republics-strategic-offensive-reductions-start-i-start-ii/. Holguin, Jaime. "Reagan's Cold War Legacy." CBSNews. CBS Interactive. Web. 17 Mar. 2015. http://www.cbsnews.com/news/reagans-cold-war-legacy/. "Communism in Crisis, 1976-89." Web. 17 Mar. 2015. https://e.edim.co/2144118/communism_in_crisis4.pdf?Expires=1426606442&Signature=HI6P99KdxuYRFkRDvMd67zL0U5OJNvU~Lyn32XYsNGUY-U7Pz0SDPqGk6Xa5TYnEAXm~yiE~TrFjUAiroF4tKhMyUSyoEJTArzeqAMKTVMm24NQ51rpHhfmzayi5H~WdyAY-Njiko6Mm8y5ne~goSp61ZkW74FE~5~PwQM14t3YNU6L3NF8N0ll~E2E~9dUpDWKS1G~XGX~vMfWr~4gccnXk3QFew61PdNUAbDQCU-LNF3Sk2Xknq5Mn7mC64TrCF~XEw0K3eflVZhqQAf3dXsHS3f7jc1c5tPMLyUrxv1FNryNfeJERVJdLX3bmQ8jXRTOh8tihf5Ee7SHEsFHrEg__&Key-Pair-Id=APKAIJNVNRBLLSTGN23Q. Gorbachev, Mikhail. 2000. Gorbachev. NY, USA. Columbia University Press.